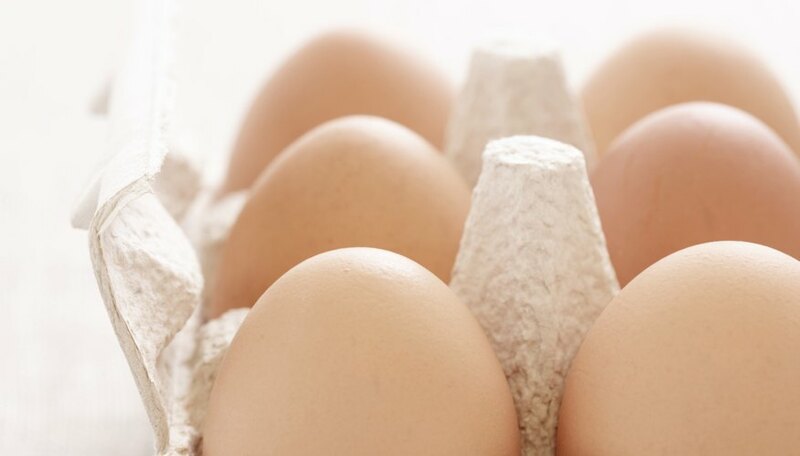 The shell of an egg consists of mostly calcium carbonate, while vinegar is just acetic acid. Combining these two materials provides a great example of an acid-base reaction. The acid (vinegar) and base (eggshell) react to produce carbon dioxide, water and dissolved calcium. The experiment also provides a unique opportunity to view and handle a "naked" egg. Place one or more eggs in a clear glass or plastic container large enough to easily accommodate the eggs. Pour vinegar into the container, adding enough to completely cover the eggs. Observe the immediate interaction between the vinegar and the eggshell. Cover the container and put it in the refrigerator. After 24 hours, carefully scoop the eggs out of the container, pour out the vinegar, return the eggs to the container, and add new vinegar to cover the eggs. Return container to the refrigerator. After another 24 hours, scoop the eggs from the vinegar and rinse them with water. 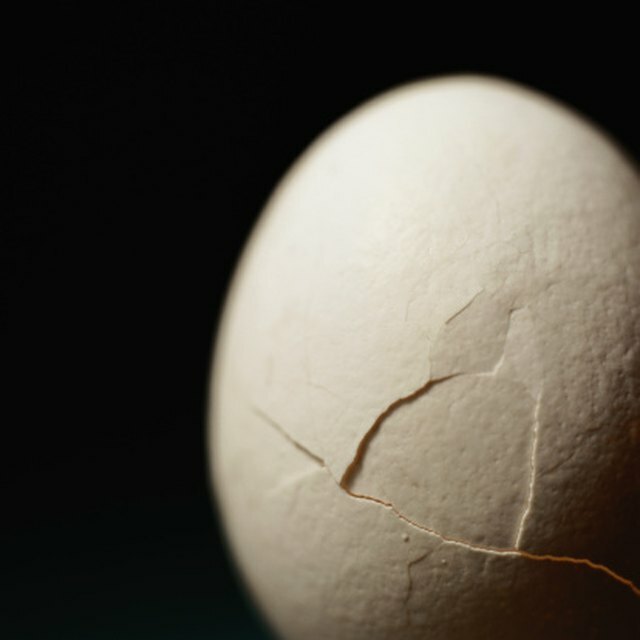 The eggshell will have dissolved away, leaving the flexible membrane still intact around the naked egg. Handle and examine the eggs, but be careful not to break the membrane or the raw egg will ooze out. There can be a second phase to this experiment. Once the eggshell has fully dissolved, the egg's semipermeable membrane remains. This membrane allows water and air to pass through, permitting a good demonstration of osmosis, as water passes through the membrane but larger molecules do not. Place one de-shelled egg in corn syrup and one in water, and observe the movement of water into or out of the egg. Putting the egg in corn syrup causes it to shrivel up, while submerging it in water has the opposite effect. Handle the egg and vinegar carefully, above an easy-to-clean surface, and wear a protective apron or old clothing, as well as safety goggles, when working with the vinegar. Ryczkowski, Angela. "Experiment on Putting an Egg in Vinegar." Sciencing, https://sciencing.com/experiment-putting-egg-vinegar-7861.html. 24 April 2017.